In my last newsletter I discussed the framework for how to develop a solid brand strategy for your business. If the ideas are not so fresh, have a quick read here before moving forward. Bobbi Brown talks a lot about her intuitive brand development style. Hear her out here. reach out to work together on your brand strategy. I will guide you step-by-step. At this time we will look at the specifics of Phase I - the Messaging Framework. Whenever I work with a new client I spent about 4 sessions working in this first section. We dive deep into the business, the brand and what you are about. This is where the strategic thinking happens. Where we look at the big picture, where does your business fit into the landscape? How do you identify what is different and appealing about you and your brand? What are your offerings and what type of needs (desires or anxieties) are you satisfying through your product or service? 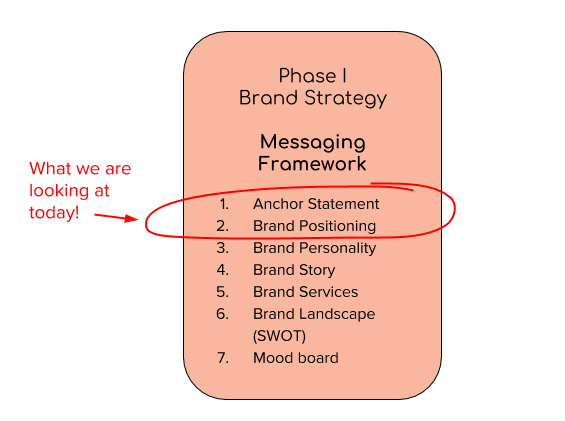 Because I cannot take you on one shot through the entire Brand Strategy, we are going to focus on the first two points: Brand Statement and Brand Positioning. There are exercises and examples included here, so give it a try! First things first. Let’s look at your Brand Statement. This is your elevator pitch. For a lot of us it can be hard to describe clearly and succinctly (and also excitingly) what we do. Can you tell me in one paragraph what your business or your brand is about? Try it. If you can and you are happy with it, great, you are good with this first step. I use a method I learned whilst researching on brand strategy and personal brand. In her Brand Mapping Process, Karen Leland asks you to look at your brand statement as your elevator pitch. The Brand Statement has be concise and to the point and it needs to define what you do, what you offer to your clients as a result and how you work. It also has to allow for conversation, so that you can build on those other points that are relevant and that will help you position yourself in the mind of those who need you. What would you want them to say about what you do? Give yourself 20-30 minutes and write a good first draft but know that as we work together and discover your strengths as a brand and the attributes you bring, this statement will organically evolve. What would you want them to say about what you DO? Alessandra is an expert in brand strategy and understands the importance of building a solid brand for every business that wants to be relevant and successful in the long term. What would you want them to say about the results you produce? (what they HAVE after working with you): Alessandra helped me define my brand and helped me analyze my industry, clients and competition to identify what is unique about me. It resulted in a clear brand statement with defined guidelines for my brand elements: logo, color, web presence. What would you want them to say about the way you do your work (qualities, characteristics, way of BEING)? Alessandra methodic approach to brand strategy, her creativity and her knowledge and experience in brand direction made me feel I was in great hands. She’s smart, approachable and loves working with a variety of businesses. Brand Positioning is that which defines you, your business, your brand. It needs to be is specific enough to differentiate you from the rest. A brand positioning statement says where your brand should be positioned in the marketplace. Simply put, it says what you do, who you serve and how your company (uniquely) does this. Specialized background, education, training or experience you have. Proprietary process you have created to work with clients. Talents or skills that set you apart. Business, industry, area or niche on which you have expertise. New way of addressing a problem or something you offer/have that is hard to replicate. To arrive at this you need to identify your desired attributes : What attributes are most critical for your audience. What do you need to have / offer to be interesting, relevant to your audience? List the most important attributes, rank them in order of importance and make sure that you identify any qualitative or quantitative actions that support these key attributes. I want you to list them all and go back and forth with all that you think is important for your audience. I am only showing three here as an example, but the list was much longer. Try to concentrate on those key attributes where you, or your product or service stands out and that is at the same time relevant for your clients. If you are lacking in a key area, identify how you can overcome those deficiencies. Do you need to restructure your offering? redesign part of your product? What is it that you provide that your clients may never have thought or articulated but when they hear it, they immediately react positively. What do you do that is difficult to imitate? As you can see, we are tackling these two first elements of your brand strategy: your brand statement and your brand positioning. Give it a try and let me know how you are doing! I’d love to hear from you and your efforts. I guarantee that you will be feel more focused about your brand and your business and that you will be able to prioritize more easily your activities.